50 size is currently out of stock. 58 size is currently out of stock. Men's leather trousers HM-1050 short of Stockerpoint in uroid. The leather trousers made of high-quality, creamy tanned deerskin from Austria are characterised by the unusual vintage look. The embroidery, made after old models, blends perfectly with the buttons in stag horn look. The extraordinary structuring of the leather with antique colour gradients give the model a unique touch. Thanks to lacing on the back of the waistband, the leather trousers can be adjusted in width. 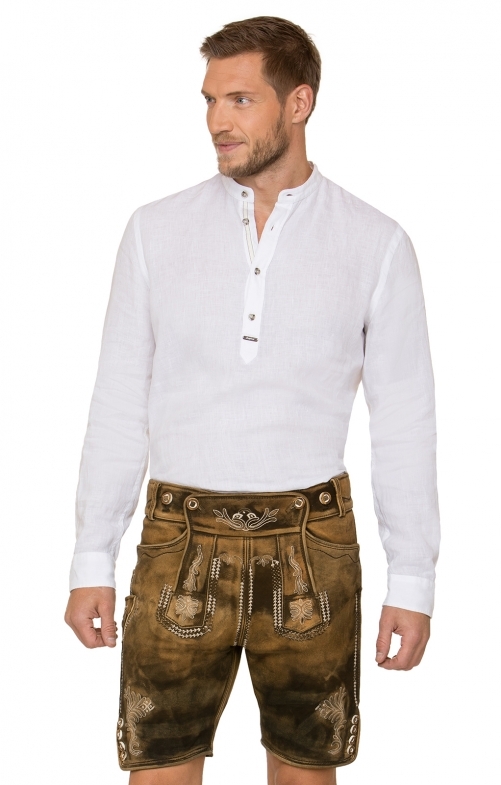 Super Lederhose, schönes Leder, dezente Stickerei. Sieht edel und hochwertig aus. Wird die neue Lieblingshose. Wird durchs Tragen noch schöner, durch die uroid Optik.